Services > What’s Good Service? At Box K, we do everything from simple oil changes to maintenance or repair to major overhauls to reprogramming your car’s computer. No matter how big or small the job, your vehicle will be returned fixed properly, cleaned inside and out, and given a thorough inspection to catch potential issues before they become a problem for you. Plus a written 2 year / 24,000 mile warranty on any work we do. We have two full-time service advisors. Their job is to listen to you, the customer. They will listen to your concerns and then address them in a professional manner. Then they will to explain everything to you: what’s wrong and how we will fix it, how much it will cost and how long this will take. 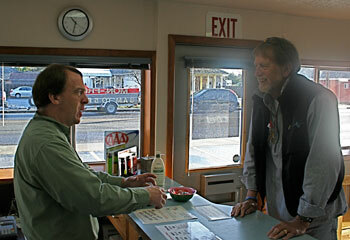 If we find something during our detailed inspection, we will make sure to explain that also. Our thorough Box K inspections allow you to budget for upcoming work, keeping you in a car you can feel confident in. It is a proven fact. Vehicles that receive regular maintenance performed by competent certified technicians who can identify problems before they occur have much less likelihood of vehicle breakdowns and costly emergency repairs. We couldn’t agree more. We have built our service plans based on these ideas. Second to the investing in a home, a vehicle is the second largest purchase most people make. Maintaining your vehicle, just like maintaining your home, will save you money, make your life more stable, and lengthen the life of your investment. Click here to see the services we provide – with great 2 year / 24,000 mile warranties! Refer us to your friends and family! 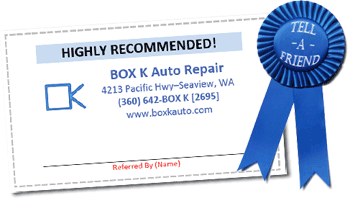 We know you trust and value Box K Auto Repair, so why keep it a secret? Allow your friends, family, and coworkers to enjoy the same experience you’ve come to expect. Click here to download a referral card. Print it and fill in your name. Give it to your friend, family member or coworker and we’ll take great care of them and credit your account with $25 to use on your next service or repair. There is no limit to this offer – refer us to as many people as you’d like for a $25 credit per person who comes in for service!